For the magazine, see Cuisine (magazine). A cuisine is a style of cooking characterized by distinctive ingredients, techniques and dishes, and usually associated with a specific culture or geographic region. A cuisine is primarily influenced by the ingredients that are available locally or through trade. Religious food laws, such as Hindu, Sikh, Islamic and Jewish dietary laws, can also exercise a strong influence on cuisine. Regional food preparation traditions, customs and ingredients often combine to create dishes unique to a particular region. Some factors that have an influence on a region's cuisine include the area's climate, the trade among different countries, religiousness or sumptuary laws and culinary culture exchange. For example, a Tropical diet may be based more on fruits and vegetables, while a polar diet might rely more on meat and fish. The area's climate, in large measure, determines the native foods that are available. In addition, climate influences food preservation. For example, foods preserved for winter consumption by smoking, curing, and pickling have remained significant in world cuisines for their altered gustatory properties. The trade among different countries also largely affects a region's cuisine. Dating back to the ancient spice trade, seasonings such as cinnamon, cassia, cardamom, ginger, and turmeric were important items of commerce in the earliest evolution of trade. Cinnamon and cassia found their way to the Middle East at least 4,000 years ago. Certain foods and food preparations are required or proscribed by the religiousness or sumptuary laws, such as Islamic dietary laws and Jewish dietary laws. Cuisine dates back to the Antiquity. As food began to require more planning, there was an emergence of meals that situated around culture. Cuisines evolve continually, and new cuisines are created by innovation and cultural interaction. One recent example is fusion cuisine, which combines elements of various culinary traditions while not being categorized per any one cuisine style, and generally refers to the innovations in many contemporary restaurant cuisines since the 1970s. Nouvelle cuisine (New cuisine) is an approach to cooking and food presentation in French cuisine that was popularized in the 1960s by the food critics Henri Gault, who invented the phrase, and his colleagues André Gayot and Christian Millau in a new restaurant guide, the Gault-Millau, or Le Nouveau Guide. Molecular cuisine, is a modern style of cooking which takes advantage of many technical innovations from the scientific disciplines (molecular cooking). The term was coined in 1999 by the French INRA chemist Hervé This because he wanted to distinguish it from the name Molecular cuisine that was previously introduced by him and the late Oxford physicist Nicholas Kurti. It is also named as multi sensory cooking, modernist cuisine, culinary physics, and experimental cuisine by some chefs. Besides, international trade brings new foodstuffs including ingredients to existing cuisines and leads to changes. The introduction of hot pepper to China from South America around the end of the 17th century, greatly influencing Sichuan cuisine, which combines the original taste with the taste of introduced hot pepper and creates a unique flavor of both spicy and pungent. A global cuisine is a cuisine that is practiced around the world, and can be categorized according to the common use of major foodstuffs, including grains, produce and cooking fats. Regional cuisines can vary based on availability and usage of specific ingredients, local cooking traditions and practices, as well as overall cultural differences. Such factors can be more-or-less uniform across wide swaths of territory, or vary intensely within individual regions. For example, in Central and South America, corn (maize), both fresh and dried, is a staple food, and is used in many different ways. In northern Europe, wheat, rye, and fats of animal origin predominate, while in southern Europe olive oil is ubiquitous and rice is more prevalent. In Italy, the cuisine of the north, featuring butter and rice, stands in contrast to that of the south, with its wheat pasta and olive oil. In some parts of China, rice is the staple, while in others this role is filled by noodles and bread. Throughout the Middle East and Mediterranean, common ingredients include lamb, olive oil, lemons, peppers, and rice. The vegetarianism practiced in much of India has made pulses (crops harvested solely for the dry seed) such as chickpeas and lentils as important as wheat or rice. From India to Indonesia, the extenive use of spices is characteristic; coconuts and seafood are also used throughout the region both as foodstuffs and as seasonings. African cuisines use a combination of locally available fruits, cereal grains and vegetables, as well as milk and meat products. In some parts of the continent, the traditional diet features a preponderance of milk, curd and whey products. In much of tropical Africa, however, cow's milk is rare and cannot be produced locally (owing to various diseases that affect livestock). The continent's diverse demographic makeup is reflected in the many different eating and drinking habits, dishes, and preparation techniques of its manifold populations. Asian cuisines are many and varied. Ingredients common to many cultures in the east and Southeast regions of the continent include rice, ginger, garlic, sesame seeds, chilies, dried onions, soy, and tofu. Stir frying, steaming, and deep frying are common cooking methods. While rice is common to most Asian cuisines, different varieties are popular in the various regions; Basmati rice is popular in the South Asia, Jasmine is often found across the southeast, while long-grain rice is popular in China and short-grain in Japan and Korea. Curry is also a common dish found in southern and eastern Asia, however, they are not as popular in western Asian cuisines. Those curry dishes with origins in India and other South Asian countries usually have a yogurt base while Southeastern and Eastern curries generally use coconut milk as their foundation. Due to Guangdong's location on the southern coast of China, fresh live seafood is a specialty in Cantonese cuisine. 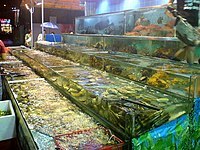 Such markets selling seafood are found across East Asia. Traditional North Indian vegetarian thali with various curries from India. Various curry dishes are found across South Asia. A market stall at Thanin market in Chiang Mai, Thailand, selling ready-cooked food. Market stalls selling food are found across Southeast Asia. 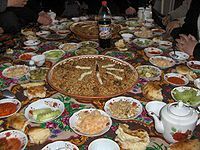 A Tajik feast. 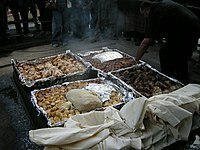 A large feast is commonly associated with cultures of Central Asia. 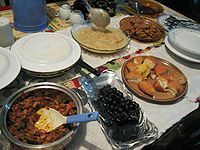 Typical Assyrian cuisine; an example of a type of meal found in West Asia. European cuisine (alternatively, "Western cuisine") include the cuisines of Europe and other Western countries. European cuisine includes that of Europe and to some extent Russia, as well as non-indigenous cuisines of North America, Australasia, Oceania, and Latin America. The term is used by East Asians to contrast with Asian styles of cooking. This is analogous to Westerners referring collectively to the cuisines of Asian countries as Asian cuisine. When used by Westerners, the term may refer more specifically to cuisine in Europe; in this context, a synonym is Continental cuisine, especially in British English. Oceanian cuisines include Australian cuisine, New Zealand cuisine, Tasmanian cuisine, and the cuisines from many other islands or island groups throughout Oceania. Australian cuisine consists of immigrant European cuisine, and Bushfood prepared and eaten by native Aboriginal Australian peoples, and various newer Asian influences. New Zealand cuisine also consists of European inspired dishes, such as Pavlova, and native Maori cuisine. Across Oceania, staples include the Kumura (Sweet potato) and Taro, which was/is a staple from Papua New Guinea to the South Pacific. On most islands in the south pacific, fish are widely consumed because of the proximity to the ocean. A Hāngi being prepared, a New Zealand Māori method of cooking food for special occasions using hot rocks buried in a pit oven. The cuisines of the Americas are found across North and South America, and are based on the cuisines of the countries from which the immigrant people came, primarily Europe. 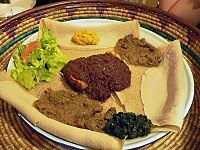 However, the traditional European cuisine has been adapted by the addition of many local and native ingredients, and many techniques have been added to traditional foods as well. Native American cuisine is prepared by indigenous populations across the continent, and its influences can be seen on multi-ethnic Latin American cuisine. Many staple foods eaten across the continent, such as Corn, Beans, and Potatoes have native origins. The regional cuisines are North American cuisine, Mexican cuisine, Central American cuisine, South American cuisine, and Caribbean cuisine. 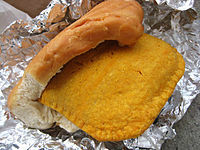 A Jamaican patty wrapped in coco bread. Tacos filled with several meat types, mainly beef, chicken and pork. ^ "Rediscover the flavors and traditions of true American cuisine!" Whatscookingamerica.net. Accessed June 2011. ^ "spice trade". Encyclopædia Britannica. Retrieved 23 April 2016. ^ Laudan, Rachel. Cuisine & Empire. University of California Press. p. 11. ISBN 978-0-520-26645-2. ^ Lindsey, Robert (18 August 1985). "California Grows Her Own Cuisine". The New York Times. ^ "Why is Molecular Gastronomy?". www.scienceofcooking.com. Retrieved 23 April 2016. ^ Adria, Ferran; Blumenthal, Heston; Keller, Thomas; McGee, Harold (9 December 2006). "Statement on the 'new cookery'". The Guardian. ISSN 0261-3077. Retrieved 23 April 2016. ^ "Sichuan Cuisine". www.chinadaily.com.cn. Retrieved 23 April 2016. ^ Bea Sandler (1993). The African Cookbook. Diane and Leo Dillon (Illust.). Carol Publishing Group. ISBN 0-8065-1398-5. Archived from the original on 16 December 2008. Retrieved 18 December 2008. ^ "The flavors of Asia". Quaker Oats Company. Archived from the original on 4 June 2007. Retrieved 19 December 2008. ^ "Cuisine Areas Of Asia". Kraft Foods (Australia). 2007. Retrieved 20 December 2008. ^ Zilkia Janer (30 March 2008). Latino Food Culture. ABC-CLIO. pp. 42–. ISBN 978-0-313-08790-5. California Culinary Academy (2001). In the World Kitchen: Global Cuisine from California Culinary Academy. Bay Books (CA). ISBN 1-57959-506-5. MacVeigh, Jeremy (2008). International Cuisine. Delmar Cengage Learning; 1st edition. ISBN 1-4180-4965-4. Nenes, Michael F; Robbins, Joe (2008). International Cuisine. Hoboken, N.J.: Wiley, John & Sons; 1st edition. ISBN 0-470-05240-6. Scarparto, Rosario (2000). New global cuisine: the perspective of postmodern gastronomy studies. Royal Melbourne Institute of Technology. Zobel, Myron (1962). Global cuisine: being the unique recipes of the 84 top restaurants of the world. Patron Press. Wikivoyage has a travel guide for Eating and drinking.